Andy Elson and Colin Prescot are the latest in a long line of adventurers who have reached for the stars in balloons. And that tradition is one where triumph and tragedy are often just a hair's breadth apart. In 1960, American pilot Joe Kittinger was the first person to break through the 100,000 feet (30,500 metres) barrier in a helium balloon. Rocket planes had broken briefly into the stratosphere, but only a balloon could allow a man to be there long enough to take vital tests for America's future space exploration. Colonel Kittinger said: "This was the first attempt to go into a space environment, so I had some concerns about what was going to happen. 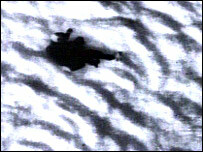 "At 63,000 feet a man's blood will boil because of the lack of pressure. "Anywhere above that you would die very quickly without a pressure suit." And it was a failure in the pressure suit that nearly forced Mr Kittinger to abandon the attempt. 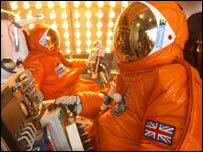 At 50,000 ft (15,200 m) a glove in the suit sprang a leak. "It meant that the blood would pool in my hand," he said. "It would pool and pool, but I didn't tell my flight sergeant because I did not want to worry him. "I also felt that if I told him, he would probably make me abort the flight." 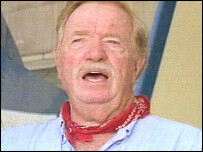 An hour and a half after lift-off, Col Kittinger reached 103,000 ft (31,400 m). He said: "I could see the clouds below, the atmosphere, and the haze layer. "It was a very profound feeling that I had about how hostile that environment really is and it's only 20 miles above the Earth." After 11 minutes at peak altitude, Col Kittinger prepared to go back down, by parachute. "I took a final look around, said my silent prayer and hit the button to start the cameras rolling and I jumped from the gondola." He fell at the speed of sound, but with no air around him, it was a silent fall. "I had no sensation of falling because I had no visual reference on anything. I thought I was suspended in space. "I turned on my back and the balloon was racing into the heavens, but it was actually standing still and I was the one that was falling so rapidly." Four minutes and 37 seconds, and 16 miles (26 kilometres) later, he was hit by the familiar sights and sounds of clouds and air. He lived to tell the tale, but another American died making a record breaking ascent the following year. Naval officers Malcolm Ross and Vic Parther reached 113,740 ft (34,668 metres). 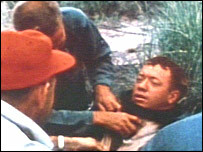 But although the flight was a success Parther was drowned after he fell into the sea from a helicopter sling after landing. The same year Yuri Gagarin made the first manned flight in space and balloon records were old hat. But that 42-year-old record still stands, and now it is up to Andy Elson and Colin Prescot to break it. To do so, they must go to 113,740 ft plus 3%. Any record claim will have to be ratified by Federation Aeronautique Internationale (FAI), the world's air sports federation.